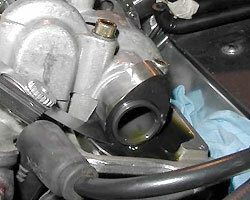 The Aprilia Futura’s valves should be checked and adjusted if necessary at every major (9,350 mile) service. Clearances should be checked with the engine dead cold and each cylinder has four valves, two inlet and two exhaust. Judging by the experience of many owners, they rarely need adjusting – many bikes have gone more than 50,000 miles before needing adjustment – and it’s normal for the intake valves on the rear cylinder to appear sooty. The procedure is exactly the same as for other Aprilia 1000cc Vee twins of the same age including the Falco, RSV and Caponord. Later RSVs got bigger valve heads. The valve check itself is relatively straightforward, adjusting them requires a competent mechanic. The Aprilia Rotax engine has shim under bucket adjustment, which means you have to remove the cams in order to adjust the valves. If you’re riding in a wet climate like the UK, it’s especially a good idea to apply copper grease to the threads of the valve cover bolts of the front cylinder at least. Failing to do so means the weather gets into the thread and the bolt seizes tight. Apriliaforum.com: Anyone seen this before on their valves?